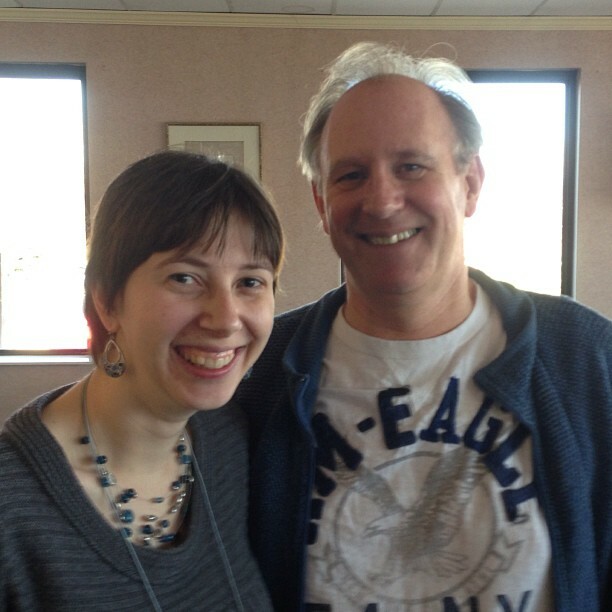 Home » doctor who , kristen , mysticon , orson scott card , peter davison , roanoke , science fiction » We met Peter Davison! Mysticon 2013 transpired across space and time at the Holiday Inn Tanglewood in Roanoke, Virginia this past weekend! Among the special guests were bestselling science-fiction author Orson Scott Card (I finally have a signed copy of Speaker for the Dead, the book that dang nearly destroyed my Spanish grade in my sophomore year of high school and I mean that in a good way) and none other than Peter Davison. 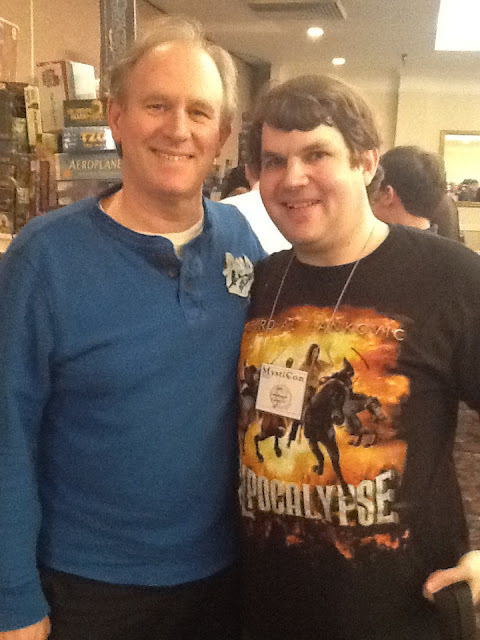 Yup, the Fifth Doctor himself! And speaking of Doctor Who, I have never seen the Doctor and his mythology so represented by fans at a sci-fi convention. I mean, there were people in TARDIS costumes, fercryinoutloud! Those were mostly ladies in blue dresses bedecked with windows and the "Police Box" plaque on the door. There were literally dozens of guys in Eleventh Doctor costumes (including not a few red fezzes), along with a healthy dose of Fourth Doctors, a number of Tenth Doctors and at least two Ninth Doctors. For the first time in my life I saw a First Doctor costume, a Third Doctor getup and a Seventh Doctor (he even had the umbrella). I have to say: it was quite refreshing to be at a convention where the quantity of Doctors vastly outnumbered that of Starfleet officers, Jedi Knights and vampires. But anyhoo, yesterday morning Kristen and I got to attend "Breakfast with the Doctor" in the hotel restaurant. This was something with very limited attendance but Kristen pounced upon tickets for it as soon as they went on sale. And did I tell you that there were Doctor Who costumes at Mysticon or what? Here's me with one of Kristen's friends. She made a crazy awesome Weeping Angel costume that would be hard to keep your eyes off even if the Angels weren't quantum-locked homicidal maniacs! off of a Weeping Angel. LOL! Davison actually explained it during his Friday panel! He said that when he took the role, they wanted his attire to be something of a departure from the one that Tom Baker had worn as the Fourth Doctor (even more of a departure than usually happens from one Doctor to another). John Nathan-Turner was describing the cricket-player's outfit that the Fifth Doctor would wear "and oh by the way, we want you to wear a stick of celery on your jacket..."
Nathan-Turner had NO real reason for the celery other than he thought it looked interesting. Davison wore it but insisted that at some point the celery would get an in-story explanation. It didn't come until his very last story was being written and Davison remembered to ask writer Robert Holmes to address the celery question. That's how the thing about celery could be used to detect deadly praxis gas game from. At the Doctor Who at 50 panel on Saturday night Davison shared a HILARIOUS story about how his youngest son has been watching the renewed series, and in the build-up to "Doomsday" he was really, REALLY terrified that Rose was going to get killed off. So much so that Davison e-mailed producer Russel T. Davies and asked him "Are you going to let Rose die?" Davies replied: "What you do you care after what you did to Adric?"